It’s good to be dictator. North Korea’s tyrant-god Kim Jong-il is apparently a big fan of South Korean actress Lee Young-Ae (known to US cinephiles mostly from two Park Chan-wook movies: SYMPATHY FOR LADY VENGEANCE and JOINT SECURITY AREA). So big that South Korean officials planned to use her to butter him up. But if I were Miss Lee, I would boost my security retinue or get the hell out of South Korea real quick, in case one day Kim gets jealous at South Korean cinema’s international prestige and decides North Korea’s needs a boost, like he’s given it in the past. His obsession with developing North Korea’s film industry was so great that in 1978 he reportedly ordered North Korean agents to abduct a famous South Korean movie director, Shin Sang-Ok, and his ex-wife, actress Che Eun Hui. The couple stayed in the communist state for eight years while making propaganda films. They escaped in 1986 and wrote a memoir about their saga. Not to be outdone, in the category of “today, US-hating dictator; tomorrow, entertainment star” Hugo Chavez has released his latest musicalbum, that I’ll bet is already topping the Venezuelan charts. Venezuelan President Hugo Chavez has released a CD of traditional folk music that features him singing, and which will be distributed free inside the country, presidential sources said. 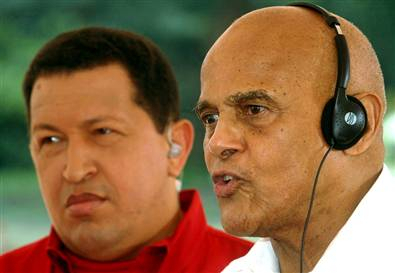 The CD, titled Canciones de Siempre which roughly translates to Songs For All Time, includes tunes that Chavez has sung during his regular Sunday Hello, President television and radio program. In July, North Korea reportedly ordered the shutdown of karaoke bars, online game rooms, video-screening rooms and Internet cafes as part of a battle to stem a flood of South Korean pop culture. Boy, the Bono article was an eye opener! Interesting that the lib whingers excoriate Bono for involvement in a game that vilifies a sycophant dictator who exhibits the exact sort of behavior that would have them marching on Washington in force if our leaders did the same. Oh well, no need to be consistent as long as they’re anti-American, eh?